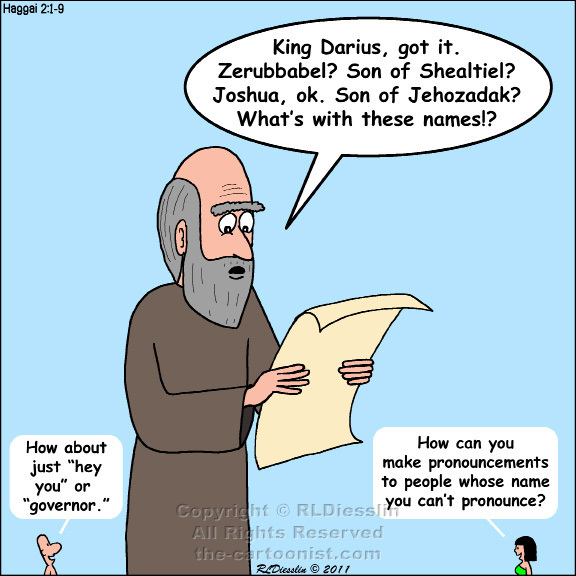 1 In the second year of King Darius, in the seventh month, on the twenty-first day of the month, the word of the LORD came by the prophet Haggai, saying: 2 Speak now to Zerubbabel son of Shealtiel, governor of Judah, and to Joshua son of Jehozadak, the high priest, and to the remnant of the people, and say, 3 Who is left among you that saw this house in its former glory? How does it look to you now? Is it not in your sight as nothing? 4 Yet now take courage, O Zerubbabel, says the LORD; take courage, O Joshua, son of Jehozadak, the high priest; take courage, all you people of the land, says the LORD; work, for I am with you, says the LORD of hosts, 5 according to the promise that I made you when you came out of Egypt. My spirit abides among you; do not fear. 6 For thus says the LORD of hosts: Once again, in a little while, I will shake the heavens and the earth and the sea and the dry land; 7 and I will shake all the nations, so that the treasure of all nations shall come, and I will fill this house with splendor, says the LORD of hosts. 8 The silver is mine, and the gold is mine, says the LORD of hosts. 9 The latter splendor of this house shall be greater than the former, says the LORD of hosts; and in this place I will give prosperity, says the LORD of hosts. In Chapter 1 Haggai calls on the people to get to work rebuilding the temple ... and they do it! Haggai's book only spans a few months but was apparently a great encouragement to the people. No less here in Chapter 2, Haggai envisions the future glory of the Temple as it is restored and God returns to it. Definitely good news in what was still hard times for the Israelites. Kudos to one of the early motivational speakers of recorded history!